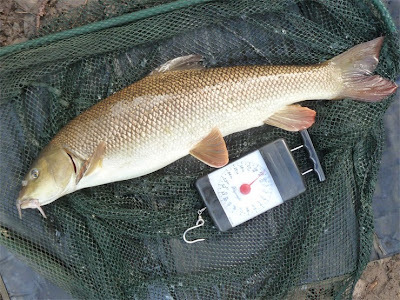 I headed back to the river armed with my kitchen scales and a ruler, time to find a 3oz gudgeon. 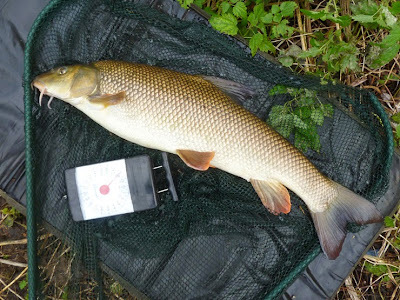 But first I had a few rolls on route to my chosen gudgeon spot. 8lb 4oz barbel above - cracking start. Next up was a 7lb 0oz fish. I chucked in a couple of handfuls of maggots and quickly set up a light quivertip, cast out and waited... And waited... They did not want to play today. At all. 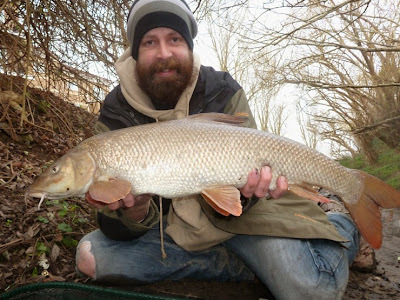 I gave it nearly four hours, the only hook ups were both from barbel, the first one led me on a dance right around the swim until inevitability caught up with my 3lb line and it escaped unseen. And the second one again went nuts on the light gear but I coaxed it gently over the net - 4lb 14oz below. No gudgeon at all, even small fish can switch off when they aren't in the mood. I had a few rolls as I headed back down the river, but no more fish. 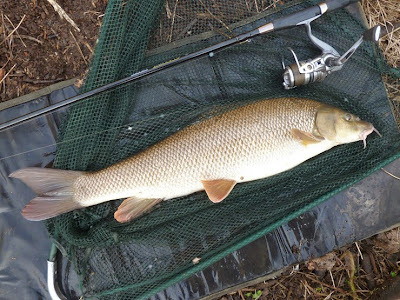 I make that 57 barbel for 271lb 5oz - I wonder if I can crack 300lb this season? Edit 14 January: LIDL are selling nutrition scales today at £7.99 which will weigh in 1g or 0.05oz divisions, incase any gudgeon fans are interested. Another afternoon like today and you will be there at 300! Shame about the gudgeon though. For those reading your blog who don't have mini fish scales, and don't fancy taking any from the kitchen, LIDL are selling nutrition scales today at £7.99 which will weigh in 1g or 0.05oz divisions, and you can switch between the two. Might test them on a minnow. Thanks, I've added that to the main post. Nice on Brian, I managed a lovely blank on Saturday, oh well never mind. I was at the clear up down your way on Sunday and we removed a very impressive array of rubbish, so maybe less fishing snags present now. Cheers Stew, can't catch the gudgeon but really can't complain! Where do you find out about the clean ups? I only found out about it on Saturday and couldn't make it - feel I should be doing my bit but need notice. Will email you Brian as need to tell you something Im not willing to write up here in public.